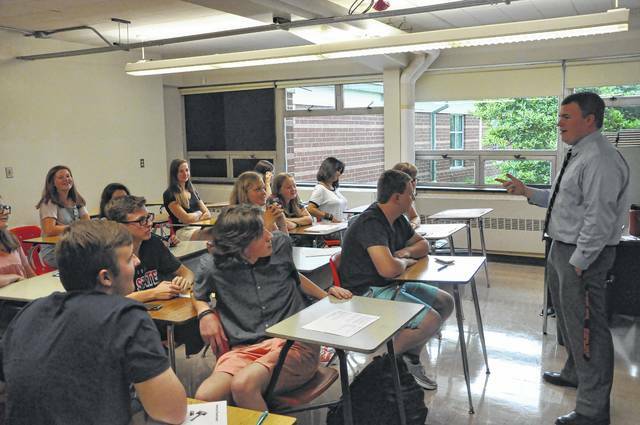 Jordan Nicol, a social studies teacher at Delaware Hayes High School, introduces himself to his students Wednesday morning during the first day of the 2017-2018 school year. Nicol graduated from Hayes in 2010 and was hired over the summer. Hayes Principal Ric Stranges said hiring Hayes alumni is a bonus because they already share common ground with their students. Wednesday also marked the first day of classes for Olentangy Local, Big Walnut Local, Delaware Christian, and Delaware Area Career Center. Buckeye Valley begins the 2017-2018 academic year today. St. Mary School starts classes on Wednesday, Aug. 23.